Then-Capt. Joseph Kittinger stands next to the Excelsior gondola which, supported by a helium balloon, carried him 102,800 feet above Earth. Kittinger set historical records for highest balloon ascent, highest parachute jump, longest drogue fall and fastest speed by a human being through the atmosphere. The 52-year-old records stood until last fall when an effort aided by Kittinger himself broke his records (Credits: U.S. Air Force photo). 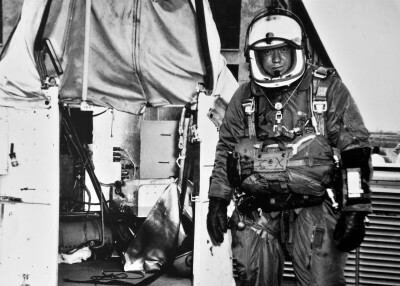 Such testing, the majority done at New Mexico’s Holloman Air Force Base, beginning with Man High in 1957 and ending with Excelsior in 1960, was the first to send man into unforgiving space. Would an astronaut survive above the atmosphere? Dr. John Stapp directed the projects Man High and Excelsior, which set out to prove that, yes, he could. From experience, Gildenberg understood the risks; he knew his forecasts might mean the difference between life and death. “I was a balloon (pilot), amateur astronomer, amateur photographer,” Gildenberg said in an oral history he gave in 1998, at the International Space Hall of Fame in Alamogordo, New Mexico. From left: Capt. 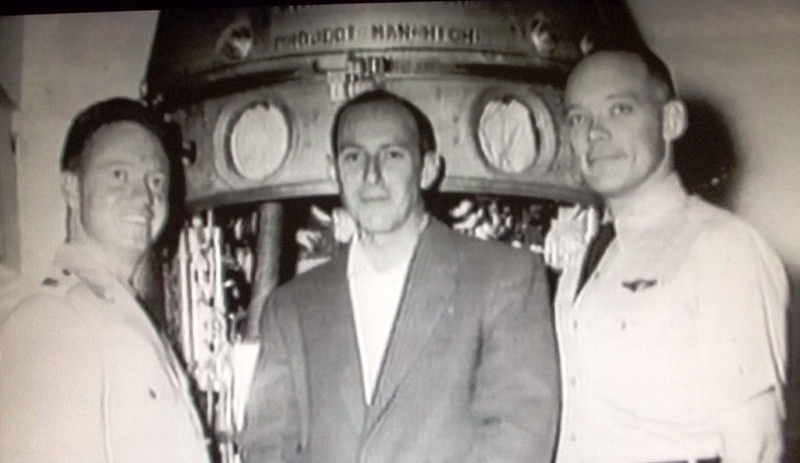 Joe Kittinger, Bernard “Duke” Gildenberg, and Dr. David Simons (Credits: USAF/Foolish Earthling Productions). The war cost the Gildenbergs remaining in Europe, everything. “We got wiped out by the Allies,” Gildenberg said. Born before the Great Depression, Gildenberg’s high school dream was to be a journalist, and at age 17 he applied to Collier’s magazine. However, when World War II came along, he set his sights on becoming a military pilot. He next applied for air crew training. “I had a nasal problem, supposedly. They washed me out on that,” he said. 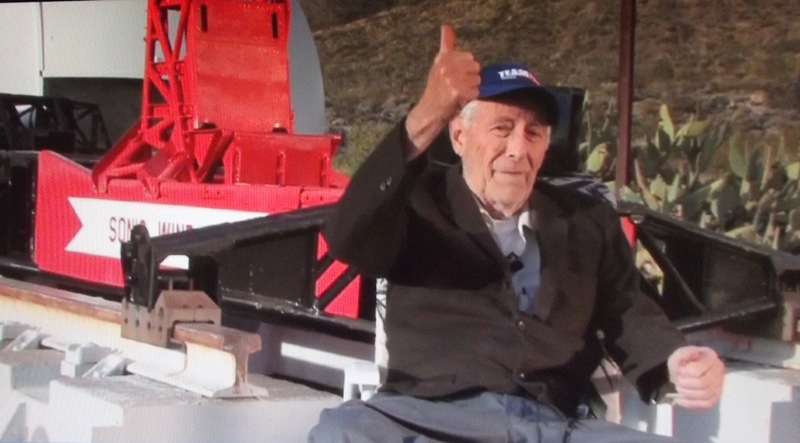 Duke Gildenberg reminisces at the New Mexico Museum of Space History, in the Foolish Earthling Productions documentary, “The Land of Space and Time” (Credits: Michael Lennic). He also participated in “meteorological cryptography,” or “trading weather reports” with allies. Knowing the weather was, of course, crucial to the success of flight missions. Stationed in the Aleutian Islands toward the war’s end, Gildenberg’s weather duties included radiosonde work with balloons that were released to gather upper-atmosphere data. Once discharged, he studied at the New York University Research Department School of Engineering, Guggenheim School of Aeronautics, he said. There he met and befriended an upper classmate, Charlie Moore, who would eventually work on Project Mogul. This balloon project carried microphones into the tropopause to, officially, listen for atomic detonations in the Soviet Union. The illnesses that Abe Gildenberg suffered from World War I set the course of his dutiful son’s personal life. Even though Kittinger’s Excelsior III jump was my usual favorite as a skydiver, the work done in Man High was even more incredible. To be cooped up in those tight fitting gondola cabins for as long as he and Simons were was a victory of training and sheer discipline.